It does not include wrist rest and mouse tray but you can add mouse tray. 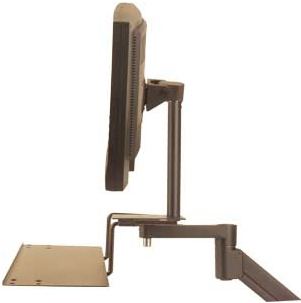 Requires 8131 Keyboard Adapter (included with 9140 data entry arm). Weight Approximate 2 lbs. Model 8056 or Model 8057 mouse tray option available. Weight Approximate 1 lbs. The weight of 8136 Keyboard Platform is approximately 6 lbs. Sturdy keyboard platform. Requires 8131 Keyboard Adapter. Optional mouse trays (8056 and 8057, weight Approximate 1 lbs) also available. All returns must be labeled with a valid Return Authorization (R/A) number, which can be obtain by contacting Ergodirect.com, on the outside of packaging. Restocking fee of 20% will be applied on all returns. Products must be in brand new, saleable condition, and never installed. Defective items may be returned within limits of the Warranty. Non-defective Custom-configured Items are not returnable. All return must be made within 30 days of receipt.